This blog post has been updated on Dec. 5, 2018. 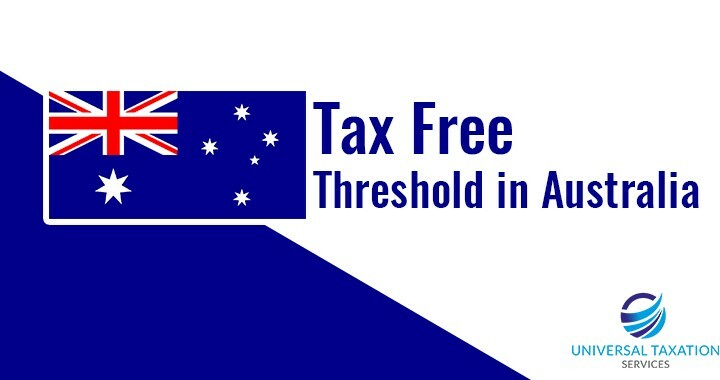 The tax-free threshold, according to ATO, refers to the amount of dollars one can earn each financial year without being subjected to tax liability. If you’re an Australian resident, the tax-free threshold is stipulated at $18,200, up to which your earnings are tax-free. Not many people are sure whether they need to make pay-as-you-go (PAYG) installments on income. Based on ATO figures, the equivalent tax-free thresholds stand above $350 per week, above $700 per fortnight and above $1,517 per month. It is important to consider that employers are not able to calculate tax liability automatically based on your tax-free threshold. As the ATO states, one needs to claim the tax threshold when you start a job. Otherwise, the PAYG tax would be levied from the first dollar you earn. How to Claim Tax-Free Threshold? Step2: Answer “Yes” at question 8 to claim the tax-free threshold from the payer on TFN Declaration Form. What if you have more than one payer? If you have multiple jobs and the combined income exceeds the threshold of $18,200, you can claim it for one of the jobs, especially the higher paying gig. Claiming on both jobs would result in less tax deductions and a tax debt at the end of the year while filing tax returns. Taxpayers, who work on multiple jobs, may follow the ATO income tax rates properly, but the total tax paid may not cover the tax payable, owing to progressive tax rates. Have one of the jobs deduct more tax each pay period to cover any shortfall by the end of the year. Contact the company’s payroll department to make the said change. Can one claim tax-free threshold at more one than one job? Yes, The ATO allows individuals to claim the tax-free threshold right from the primary source of income that gives you a higher salary. But then if you are sure that your secondary job and its combined income with the primary income is not exceeding $18,200, you can claim the tax-free threshold at both jobs. What if your primary source of income exceeds $18,200 alone? Your employer is aware of the payment exceeds the tax-free threshold at your primary job, and he or she will continue to withhold at the tax rate for specific tax brackets. The process is automatic, and no one has to track the dollars earned. The foreign resident is treated as the same as any non-resident. In this case, your tax-free threshold annually will be lower than the tax threshold available to resident taxpayers. You are entitled to a tax threshold of $13,464 plus ($4,736 divided by 12 months, multiplied by a number of months you were a resident for tax purposes, including the month you left). Combined with an additional $4,736 applicable for a number of months residing in the country during the income year. The financial year runs from 1 July to 30 June, so one should count the months you were residing in Australia within the period. Why is my refund lower than last year?Since the tax-free threshold is $18,200, it is likely that you might have paid less tax and hence received more money for each payout. A bill payable or a refund is to cover up the difference. Most taxpayers with multiple jobs have this predicament because sometimes the total tax paid on your income may not cover the tax payable owing to progressive tax rates. What can I do to ensure I get the same refunds every year and not lower?Have one of the jobs deduct more tax for each pay period to cover the shortfall in tax payables. Contact the payroll department to make this change. Universal taxation consultants can adjust the shortfall amount for each payout systematically for the entire year.Contact Universal Taxation to know how much tax you have paid against your earnings and if there is any shortfall that can be adjusted to pay as you go. I cannot afford to pay the shortfall back right now. What options do I have?Universal Taxation Office can defer the lodging of tax returns until a due date next year. But you need to finalize tax return and hold for lodgement in May or before due date set by ATO. I’m currently working 10 hours a week at Job A and would soon work for 10-20 hours a week at a new job B. What are the best options for my case?Well if your total income is below $18,200 – you can choose tax-free threshold options for both jobs in the TFN declaration. If one job’s income exceeds the threshold – claim Tax-Free Threshold in only one job that presents higher income. Claiming the threshold at both jobs will result in lower tax deduction and higher tax at the financial year-end. What if I am not an Australian Citizen? What does it mean for Tax Purposes?If you are not an Australian Citizen, your entire income is taxable with no tax-free threshold, applicable in your case. I’m doing a job that pays me more than $18,200. But I have not claimed tax-free threshold yet. Will I get the huge tax payments refunded once I claim it?Yes, you will get the tax payments refunded. You need an experienced tax accountant to file a refund for you at the end of the financial year. Additionally, if you want to stop the huge tax cut, re-submit the TFN Declaration form the employer to adjust the same in your payout. I’m currently doing two jobs but the income from both is not fixed. Should I claim the tax-free threshold in this regard?We recommend opting for tax-free threshold for a job that pays you more than the second job. If the income is less than $18,200 annually, claim a refund. If the amount exceeds $18,200, the due taxes will be lower too. I’ve two jobs and opted for the tax-free threshold for a lower paying job. Can I swap the threshold for the job that pays me more?Yes, you can ask your employer who pays more, to consider for tax-free threshold claims. Opt out of tax-free threshold from the employer who pays you less today. Ask any query regarding tax threshold or filing taxes to Universal Taxation today! Posted in tax guide, tax tips and tagged australia, tax, threshold.